Many women now consider nail polish an integral part of their makeup routine. In some cases, it is part of their overall appearance, in others, it is itself a bold fashion statement. The practice of what is now called"Nail art", which has developed dramatically in recent years, is due to the wide variety of nail polishes, different shapes and different effects available to consumers. These products depend on a fairly wide range of technologies at the service of varnish manufacturers. Current trends include : - strip nail polishes, - gel nail polishes for use in the living room or at home, - nail polishes changing color, - textured nail polish, - breathable nail polish. Several articles have described nail polish both functionally, i.e. as a decorative coating for nails, and formulationally, describing the technical requirements for achieving desired decorative effects and performance. This article aims to discuss some of the new trends in nail polish and their underlying technologies. One of the main trends is the use of nail polish strips. These may be simple shades of colour, stripes with decorative patterns and/or effect pigments, including irregular shiny particles (glitter) or other regularly shaped particles (glitters). Simply search the Internet for the term varnish strips to see the different varieties available. 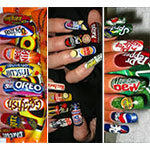 To make these patterns, you can buy either nail stickers or nail bands. Nail stickers are usually made of soft plastic like vinyl with an adhesive base. Nail polish strips are essentially polish that has been applied to a layer of adhesive with a removable backing, and partially or completely dried and cut. A number of US patents describe important details on the different ways they are obtained. For example, several coats of varnish can be applied to already dry coats to achieve looks such as the"French manicure". In addition, decorative patterns can be printed on the varnish, or glitter and metal foils can be applied. Some recent web varnish variations recommend using a top coat, or combining the strips with a gel top coat to ensure a better hold. For example, a company combines a base layer with a colour layer and finally a final surface layer on the same varnish strip. Early examples of strip varnishes used traditional nail varnish formulations. More recently, stronger and more extensible and flexible bands have been obtained by using higher percentages of higher molecular weight nitrocellulose than previously used. These higher percentages contribute to the ability of the films to stretch better and dry to a stronger, softer film due to the longer chain size of the polymer molecules. The higher viscosities of these formulations require different application methods. In particular, nail polish should be heated to 100-150°C before being extruded onto the adhesive backing. The films are then partially dried using infrared heating or a hot air blower to allow easy application of the tape to the nail. Once the consumer places them on the nail, the remaining solvent evaporates, leaving a stronger film on the nails which is why the product packaging says:"Unused strips should be discarded". This other category of"new varnishes" is a definite success. Instead of nitrocellulose-based tapes, UV-curable formulations can be used for both the adhesive backing and the various decorative layers. These formulations contain, in addition to traditional varnish filmogens, monomers derived from acrylic acid which undergo UV polymerization. The method of use provides for the use of an initiator incorporated into the formula, which forms free radicals by activation with UV light to initiate polymerization and form acrylic polymers in situ. Oligomers having functionality (acrylate and methacrylate) at each end of the molecule, are added to obtain flexibility. The resistance is given by the incorporation of polyfunctional monomers. These formulations must reconcile the level of each polymerizable component so that the film formed is neither too soft and soft nor too hard and brittle. Given the specific application, the use of these products is reserved for professional use and the product must be applied by a manicure. Some rare consumer products exist on the market. This product category will be analysed in more detail in a future contribution. Nail varnishes with color-changing effects can be based either on thermochromy, i.e. activation by temperature, or photochromism, activation by light. In all cases, an external stimulus initiates the colour change. Glasses with lenses that darken in the sun are an example of photochromy. A good example of thermochromy is the"mood ring" whose colour changes according to the temperature of the skin, depending on the peripheral circulation, itself changing according to the emotional state of the person, hence the name"mood ring". For photochromy, the basis of color change is an organic molecule that can exist in one of two configurations. The selected molecule must have certain structural characteristics that allow its conversion from a non-conjugated configuration to a conjugated configuration. Classes of molecules that may exhibit photochromy include spiropyrans, spirooxazines and diarylethenes. Their change in colour results from the breaking of a C-O bond under the effect of UV excitation. This photo-activation leads, via a structural rearrangement, to the formation of an open structure molecule (merocyanin) which absorbs in the visible. These compounds are used in particular in the composition of lenses for sunglasses. Photochromism is not limited to organic molecules and is also found in inorganic compounds such as silver halides. Under the effect of light radiation, we witness the oxidoreductive reaction, Ag⁺ + X- → Ag⁰ + X⁰ (X = Cl, Br, I) with the formation of silver colloids and the passage from a light material to a dark grey material. When the excitation stops, the opposite reaction takes shape. The material returns to its stable configuration and covers its initial coloration. Commercial examples of photochromic nail polishes are available. Another product (SunChangeNails) ranges from colorless to color changing when exposed to sunlight. It can also be used as a top coat or top coat over conventional nail polishes to give combined effects to the exterior. Thermochromy can be achieved using liquid crystals or leuco dyes. Some liquid crystals are capable of displaying different colors at different temperatures. This modification depends on the selective reflection of certain wavelengths of the crystal structure of matter as it passes from the crystalline phase at low temperature, via the anisotropic chiral phase or the helical nematic phase, to the isotropic liquid phase at high temperature. Only the nematic mesophase has thermochromic properties, which limits the effective temperature range of the material. Liquid crystals are used in microcapsulated form to protect them and maintain their thermochromic properties. A good example of applying liquid crystals that change colour is a band of thermometer applied to the forehead to indicate body temperature. Leuco dyes are also used in microcapsules, but for a different reason: the capsules contain the dyes in a solvent with a relatively low melting point and an organic acid and, in some cases, an acid activator. When the temperature is below the melting point of the solvent, the dye, acid and activator (if necessary) are in the immediate vicinity, allowing an electronic interaction, i.e. a donation of hydrogen atom between the molecules, leading to the rearrangement which produces the coloured state of the dye. As the solvent melts as the temperature rises, the molecules separate and there is no interaction, leading to the colourless state. An example of the use of leuco dyes is in a package that changes colour during cooling, for example a beer label that changes colour to indicate that it is cooled to the correct drinking temperature. For nails, the system should be designed so that this transition temperature is close to a temperature where the nail polish is exposed, including variations in body temperature. Also, as the temperature change may not occur permanently or regularly through the nail, different effects appear such as color changes, dots, gradients, etc.. This is one of the characteristics that makes thermochromic nail polishes so interesting. Some commercial examples of thermochromic nail polishes exist on the market (Mood Polish and Orly12). Beyond stripes and color change varnishes, textured nail polishes have become popular. The textures can vary from satin to matte, and from granular size sand and caviar to a more"fuzzy" or hairy size. All these textured varnishes contain different types of particulate matter. Satin and matt nail polishes often contain silica, which is also used to give a satin and matt effect to the wood. The degree of satin or matt is determined by the amount of silica used. Polyethylene terephthalate (PET) fibres are used to give a three-dimensional woven fibre effect to nails. Some products use silica to provide a gel structure to the formulation and keep the fibers in suspension. Textured velvet" nail polishes are obtained with coloured powders sprinkled on the nails before the polish is hardened for a velvety finish once dry. The velvet effect can also be obtained by using larger silica particles than those used for the satin or matt effect. Caviar" finishes on nails are obtained by applying glass or plastic microbeads to the nails during drying, by pouring the beads onto the nail or by inserting the nails into a small container of microbeads. Once the varnish has dried, a top coat is applied to fix the beads to the nail. Different effects can be obtained depending on the shade of nail polish and the color and size of the microbeads. Magnetic nail polishes are formulated with particles of different colors that orient themselves when a magnetic field is applied to the wet nail polish, giving a contrasting pattern. Magnetic particles can be made of any material that responds to a magnetic field, including nickel, cobalt, iron and rare earth metals such as gadolinium, terbium, dysprosium and erbium. Metals can be used in any state of magnetic susceptibility, such as an alloy or oxide. The most commonly used metal appears to be magnetite, i.e. Fe3O4 iron oxide. It is easily available and its use is already known in make-up and nail polish. In addition, the particles used are preferably non-symmetrical, i.e. oblong in shape, so that, when exposed to magnetic fields, the alignment of their non-symmetrical shape creates patterns that are visible because of their contrasting colour. The magnets supplied with the nail polish with purchase can consist of several parallel or other shapes, to create strips or other patterns in the nail polish. This example shows how applying the magnetic field to the nail polish can create a pattern. Normally, when a top coat is applied with nail polish, it spreads and dries to a smooth finish. This is because the top coat contains many of the same ingredients found in nail polishes, especially solvents, which control the drying speed. Cracked nail polishes are based on the principle of rapid and uneven drying, which is achieved by adding ethyl alcohol to the formulation. When a cracked top coat is applied to the nails, the ethyl alcohol begins to evaporate rapidly, causing changes in the surface tension and viscosity of the film. These changes cause irregularities in areas that dry faster than others. This can happen from the outer edge, or from any area of the film where the evaporation rate is faster. Once the topcoat begins to separate, its separation rate increases, leading to a cracked finish. This effect is more visible when the varnish and top coat are clearly different colours, i.e. black and white, silver and black, neon and standard colours, etc. The effect also depends on the thickness of the cracking layer: thin films cause thin cracks, while a thicker film will lead to thicker, more visible cracks. A new nail polish technology is the"breathable nail polish". Initially developed by Wojciech Inglot, it allows water and oxygen to pass through the film, offering a potentially healthier alternative to standard nail polishes and especially gel. This was done using a resin similar to that used in contact lenses, which must allow oxygen to enter the eye through the lens. One of the interesting applications to this varnish came from the Muslim community. For practicing Muslim women, wearing nail polish is a challenge because of the practice of wudu (washing the body in preparation for prayer). If a Muslim woman wears a traditional nail polish, she must remove it before she can perform the cleaning rites. This is why these new varnish textures were quickly disseminated among the Muslim community. A test conducted by religious authorities for its water permeability at the Orange County Islamic Institute concluded that it was acceptable. Another company, Tuesday in Love, has developed a version of a water-permeable nail polish based on microporous technology. An additional advantage of this technology is the ability to remove the film from the nail in one piece, once dry. The number of effects available to consumers today has never been more varied. Almost any desired effect can be achieved thanks to the different varnishes, their finishes and combinations, to allow the wearer to express his individuality and creativity. While it may seem that traditional nail polish formulations have not changed, advances such as those described, including new colours, textures and breathable new nail polishes show that innovation is on the move. Who knows what will be possible in the next five to ten years? Case to follow. This contribution was produced and adapted from the article published on 15 January 2014 by Frank C. Pagano, PhD Chanel Inc. in Piscataway, NJ, USA, Technology-driven Trends in Nail Polish Color and Texture . This adaptation was made by Jean Claude Le Joliff in collaboration with Sabine Vic. Sabine Vic is a chemical engineer from ENSC Montpellier. She holds a Master's degree in Cosmetics (Isipca 1990) and a Master's degree in Biochemistry from the University of Languedoc. She has held positions of responsibility in the cosmetics industry through several companies, including Biotherm (Formulation), Yves Saint Laurent (Head RD Make-up, then Technical Coordination), and Parfums Christian Dior (Head Galenic Make-up Innovation). She has proven experience in formulation. A biologist by training, Jean Claude Le Joliff was a man of R&D for many years. Successively in charge of R&D, then of Research and Innovation in a large French group of cosmetics and luxury goods, and after an experience of setting up a research centre (CERIES), he turned to innovation management. He has also been an Associate Professor at the University of Versailles Saint Quentin (UVSQ) and remains in charge of courses in the framework of several specialized courses: ISIPCA, IPIL, ITECH, UBS, UCO, SFC, etc. He is the founder of inn2c, an R&D and innovation consulting company. Consultant for several international companies, he has actively participated in projects such as Filorga, Aïny, Fareva, and many others. He created the Cosmétothèque®, the industry's first conservatory of crafts and know-how.